Google Alerts is a basic research tool for anyone putting together a search of news about a topic. And it has now had one of its most useful features restored – the ability to subscribe to an RSS feed of your Alerts results. This feature had been a long standing part of Google Alerts until Google Reader was phased out last spring. At that time, Google also removed the ability for Alerts users to subscribe to RSS feeds, leaving only email delivery of results. I don’t know about you, but I try to preserve my email box for one to one interactions. That means finding other ways to receive one to many and other types of notices and news. And by far and away, RSS is my preferred method for this purpose. So, I was delighted to discover that Google had restored RSS feeds as a delivery mechanism for Alerts. Thank you Google! You’ve just made yourself even more useful and indispensable. Like more and more people, you’ve made the switch to the Chrome browser. But you quickly discover a glaring absence: the basic install does not display the orange RSS icon in the address bar when you are on a site that offers a feed. Dave Winer reminds us that we don’t have to live without RSS when we use the Chrome Browser. 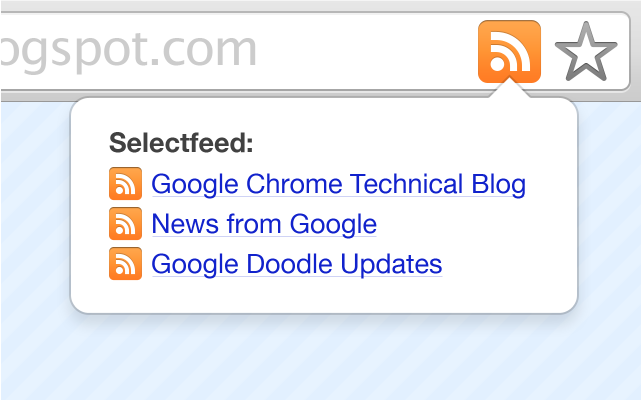 In fact, Google itself publishes an extension that restores the orange RSS button to your browser address bar. Get the RSS Subscription Extension (by Google) in the Chrome web store. Install it. Subscribe to the content sources that you don’t want to miss.